Mimico and Long Branch GO Stations will be fully accessible by 2023 with electrified, 15-minute service by 2025. Long Branch, Mimico and Humber Bay Shores’ residents came out in force, with approximately 160 people attending Metrolinx’s two open houses on July 5 to detail its plans and timelines to build the new Mimico and Long Branch GO Stations. The GO stations will be fully accessible with the ability to access each station from both sides with new tunnels. 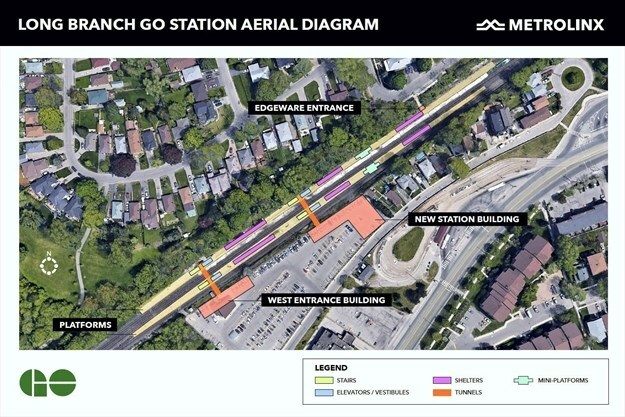 At Mimico, a new passenger drop-off and pickup area will be built on Manchester Street, with improved access to Long Branch GO Station from Edgeware Drive. Passenger pickup areas, bicycle shelters and pedestrian walkways, as well as new heated shelters, new canopies and platform snow melting are among the upgrades. Mimico Station was built in 1967, the year GO Transit launched. Long Branch Station opened in 1980. Today, GO’s Lakeshore West Line, which includes the Mimico and Long Branch Stations, is its busiest with 18 million passengers a year. Metrolinx continues to consider a potential Park Lawn GO Station through a preliminary design business case. Community leaders and local politicians long argued the best transit improvement for the area would be a Park Lawn GO stop. 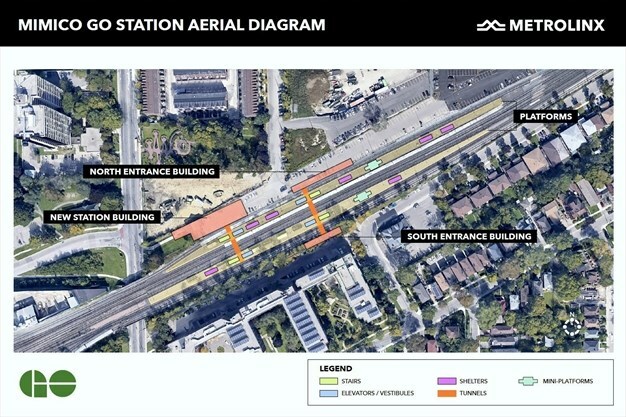 In February, Metrolinx announced it would consider a Park Lawn GO Station after it didn’t make the cut in 2016 to proceed to the preliminary design stage. 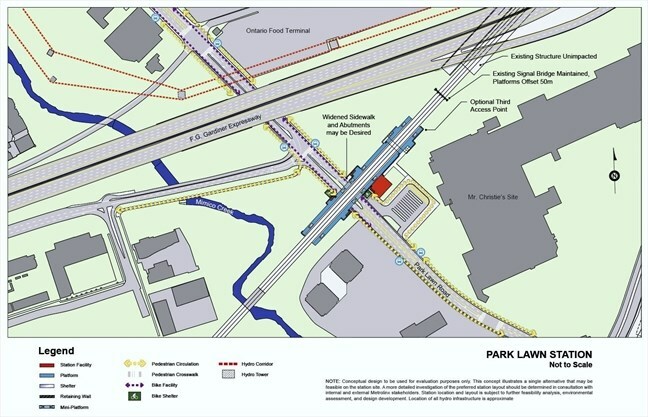 “The Park Lawn station location has benefits that are greater than the costs, and therefore should advance to the next stage for preliminary design business case,” Metrolinx said in a report. “Transformative for the community” is how Grimes described it in a statement at the time, regarding the Park Lawn transit hub that incorporated GO and TTC services. “As part of this review, a refined station layout and location at Park Lawn was found to be an increasingly strong transit investment,” Metrolinx said in its open house presentation. If the Metrolinx board approves the project, the station will require funding and an Environmental Assessment before commencing construction. In April, Metrolinx and Infrastructure Ontario issued Requests for Proposals to design, build and finance the Lakeshore West infrastructure improvement project to three shortlisted teams: Steelhead, EllisDon Infrastructure Transit and West Link Partners. Christopher Moore, president of the Mimico Residents Association, said Mimico residents’ top priorities for their neighbourhood GO Station is full accessibility and the creation of a south entrance, which requires a deal with Toronto Community Housing. GO ridership at the Mimico and Long Branch stations is expected to grow exponentially in future. Today, Mimico GO Station sees approximately 1,200 riders a day, a number expected to skyrocket to between 2,000 and 4,000 riders daily in 2031. Approximately, 1,000 people take the Long Branch GO daily, but that number is forecasted to potentially double by 2031.